The location was perfect and the apartment was just what we were looking for. It was extremely comfortable and a very pleasant place to stay. Great surroundings and views from the kitchen window. Even with the storm and lack of electricity- the management went out of their way to make us feel at home. It was an easy walk to the cafes, shops & restaurants in Sandy Bay. The apartment supplied basic cooking crockery which allowed us to have breakfast at home before a day of exploring. We had a very comfortable couple of days at Grosvenor Court. 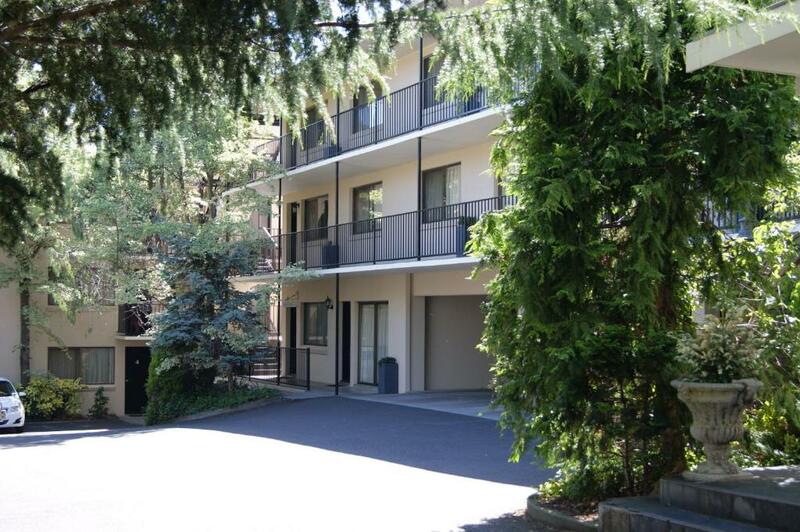 Great location, spacious and well equipped apartment, and friendly service. Very friendly. Room clean and had everything we needed. An extremely comfortable bed, top reception service and close and handy to cafes and shops. Great location, quiet for sleeping but walking distance to so many choices of restaurants and supermarkets. Walked to Salamanca markets and MONa ferry was easy and quick. Supermarkets close by, and Restaurants, but self catering was easy. WIFI was excellent. Bedding was great, and the location was very quiet. Lock in a great price for Grosvenor Court Apartments – rated 8.9 by recent guests! Grosvenor Court Apartments This rating is a reflection of how the property compares to the industry standard when it comes to price, facilities and services available. It's based on a self-evaluation by the property. Use this rating to help choose your stay! Grosvenor Court is located in the quiet streets of Sandy Bay within easy walking distance to Hobart CBD (Central Business District). Grosvenor Court provides fully self-contained spacious studio and 2-bedroom apartments as well as 2, 3-bedroom houses and 1, 4-bedroom house. Each are given a basic daily service (except for public holidays). Some apartments are located on the ground floor, while others are located on the upper floors and are accessed via stairs only. Other nearby attractions include Salamanca Place, Battery Point, and Constitution Dock. Wrest Point Casino and the University of Tasmania are also just minutes away. This is our guests' favorite part of Hobart, according to independent reviews. This property is also rated for the best value in Hobart! Guests are getting more for their money when compared to other properties in this city. 뀐 Located in the real heart of Hobart, this property has an excellent location score of 9.1! When would you like to stay at Grosvenor Court Apartments? Open-plan apartment with private bathroom and cooking facilities. Please note the maximum occupancy is strictly 3 guests (including children of all ages). If on arrival the maximum occupancy is exceeded, the property reserves the right to refuse the reservation and the money will not be refunded. Spacious 2 bedroom apartment with fully equipped kitchen. Please note the maximum occupancy is strictly 6 guests (including children of all ages). If on arrival the maximum occupancy is exceeded, the property reserves the right to refuse the reservation and the money will not be refunded. This open-plan apartment features cooking facilities and a private bathroom. This spacious house offers a private courtyard. There is a private driveway with parking space for 2 cars. Its large kitchen includes oven, ceramic cook top, full-size fridge and dishwasher. The lounge room features LCD TV, DVD player and Nintendo Wii. A washing machine and dryer are also provided. Please note the maximum occupancy is strictly 8 guests (including children of all ages). If on arrival the maximum occupancy is exceeded, the property reserves the right to refuse the reservation and the money will not be refunded. Please note this property is located on Princes Street. Please note for stays of 8 or more nights, the house will be cleaned once a week. Please note there are no alternative bedding configurations. Please note this property has a strict 'No Party Policy'. This spacious house offers a private courtyard. Please note that there is no off-street parking for this house. Parking is available along Grosvenor St. Located on the top floor, this spacious apartment offers views of Mt Wellington from the kitchen window. It features a fully equipped kitchen, a satellite TV, DVD player and electric blankets. Please note the maximum occupancy is strictly 5 guests (including children of all ages). If on arrival the maximum occupancy is exceeded, the property reserves the right to refuse the reservation and the money will not be refunded. Built in the early 1900's, this 1-level, 4-bedroom house has been renovated and offers a private driveway with 2 car parking spaces. Guests enter from the back of the house into a large open plan kitchen/dining/lounge area. The kitchen comes complete with an oven, ceramic stove top, dishwasher, Nespresso coffee machine and a butlers pantry. There is 8-seater dining table and the lounge has 2, 3-seater couches and a large LCD Smart TV. There are 4 bedrooms 3 of which have queen sized beds and the 4th bedroom has 2 single sized beds. All have LCD TV’s. The main bedroom has an private bathroom and a walk-in wardrobe. The main bathroom has a walk-in shower, a deep bath, vanity and a toilet. The laundry has both a washing machine and a tumble dryer. Please note this property is located at 40 Grosvenor Street. Our staff love to travel overseas and throughout Australia but most of all love to talk about our wonderful State of Tasmania. Grosvenor Court Apartments is located in Sandy Bay in a very quite residential area with supermarkets, banks, bakeries and clothes shops within 1 block of our property. Salamanca Market is a 20 minute walk with an extra 5 to the city centre. In the opposite direction is West Point Casino which is a 12-15 minute walk and only a few minutes in the car. Located at the end of Grosvenor Street is the University of Tasmania only a 10 minute walk. House Rules Grosvenor Court Apartments takes special requests – add in the next step! Grosvenor Court Apartments accepts these cards and reserves the right to temporarily hold an amount prior to arrival. Please note that there is no elevator access available. Upstairs accommodations can be accessed via stairs only. If you expect to arrive outside reception opening hours, please inform the property at least 24 hours prior to arrival, using the contact details found on the booking confirmation. Please note 1 free parking space is available per apartment, except for the Three-Bedroom House - Grosvenor Street. For more information please contact the property using the contact details found on the booking confirmation. Please inform Grosvenor Court Apartments of your expected arrival time in advance. You can use the Special Requests box when booking, or contact the property directly using the contact details in your confirmation. Old style accommodation, Poky kitchen, Poor lighting in every room. Excellent value. Kitchen facilities were good. Nice to be able to cook meals. We check-in late and the property host (Gareth) had given us clear instruction on what to do during the late check in. All the facilities were good and the location is perfect. Everything is good. Thumbs up. To reach our unit had to climb three flights of stairs. this was a little hard with two of us struggling with bad knees. The location was good and quiet. Beds were comfortable. A better brand of coffee in the room. A very enjoyable stay. Quiet area, leafy suburb. very pleasant suroundings. Well equipped room with small kitchen.